A patient judges the outcome of an orthodontic treatment by assessing the final improvement in facial esthetics. The binding relationship between orthodontic treatment and facial esthetics has made the facial outline as an important guideline for the treatment planning. Social acceptance, psychological well-being, and self-esteem of an individual are related to physical appearance. It has been established that self-esteem is strongly dependent on facial appearance. One of the primary reason for patient to seek orthodontic treatment is to make their facial appearance more esthetic and pleasing. Esthetic harmony has become one of the major objectives of orthodontic treatment. Since, it is impossible to quantify an attribute such as beauty, the science of orthodontics concentrated on quantifying various linear and angular measurements in assessing the proportions of pleasing faces. With the advent of cephalometrics, the emphasis shifted to the assessment of bony foundation of the face and positions of teeth. However, it was soon realized that the correction of hard tissues to the normal values need not always bring about an improvement in the facial appearance. In this context, soft-tissue assessment gets a priority over hard tissue assessment. Photographic evaluation of orthodontic patient has assumed considerable importance as an essential aid in treatment planning since it depicts a very close representation of the appearance of the person. It picturizes how a face actually looks and is therefore superior in this respect to cephalogram which gives only the facial outline. Therefore, it becomes necessary to supplement the cephalometric analysis with photographic evaluation. Previously established norms for soft-tissue profile analysis cannot be directly extrapolated to the Indian population. Thus, there is a need to develop norms pertaining to Indian ethnic groups. The aim of this study is to establish the angular photogrammetric standards of soft-tissue facial profile for Indian males and females and also to compare the sexual dimorphism between them. This study analyzes the lateral profile photographs of Indian population satisfying the inclusion criteria. 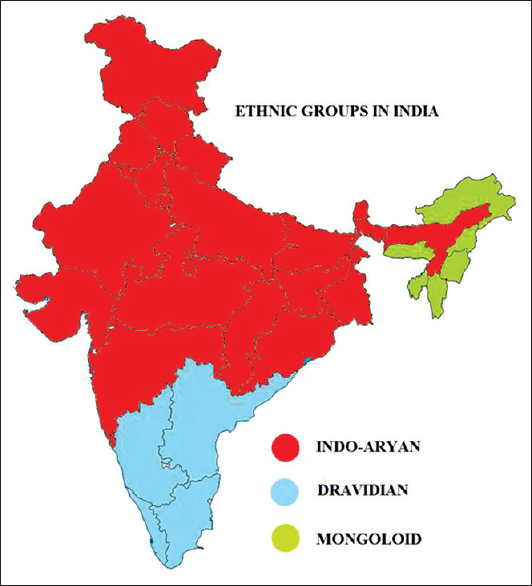 Indian population is divided among the following ethnic groups – Indo-Aryan 72%, Dravidian 25%, Mongoloid and other 3% [Figure 1]. The 72% of Indo-Aryans includes Konkani, Marathi, Gujarati, Punjabi, Kashmiri, Hindi, Oriya, Bengali, and Assamese. The 25% Dravidians includes Tamil, Telugu, Kannadiga, Malayali, and 3% constituted by Mongoloids and others including Meghalayans, Mizo, Tripuri, Manipuri, Naga, Lepcha (rong), and Arunachli. To obtain a power of 95% the sample size estimated was 250. By allowing a buffer of 20%, the estimated sample size was 300. 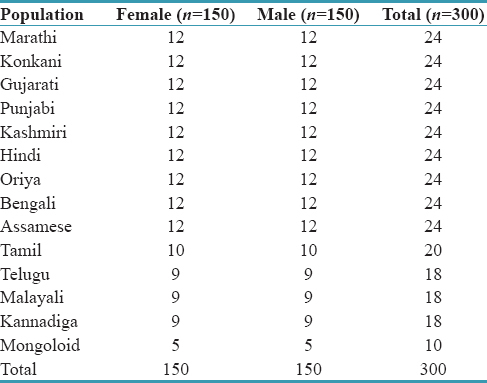 The distribution of the samples across India based on their ethnicity has been described in [Table 1]. Samples were divided into two groups. Group A included 150 female samples. Group B included 150 male samples. Tracings were made on all lateral profile photographs using a FACAD tracing software. The Institutional Review Board clearance and approval from the Human Ethical Committee were obtained from the University for this study, and patients gave their written consent for participation. The sample for the study was selected on the basis of the following criteria. Full complements of permanent teeth irrespective of third molar status. Angles Class II or III molar relation. Underwent previous orthodontic or prosthodontic treatment, maxillofacial or plastic surgery. Individuals having any facial asymmetry or trauma were eliminated. Photographic setup consisted of a tripod (Photron Tripad Stedy 450; Phtstd-45: 1725 star house, Hong Kong) that held a digital single-lens reflex camera (Canon, model EOS 600D; EF-S 18–55 IS II; Shimomaruko, Tokyo, Japan). The tripod controlled the stability and the correct height of the camera according to the participant's body height. This ensured a correct horizontal position of the optical axis of the lens (The Canon EF-S, 18–55 mm lens). Flash was not used; natural light was used as a source of light for image capture. The camera was used in its manual position, the shutter speed was 1/125 per se cond, and the opening of the aperture f/11. The participant was positioned on a line marked on the floor and framed alongside a vertical metallic centimeter scale [Figure 2]. The scale allowed measurements at life size (1:1). On the opposite side of the scale and outside of the frame, a vertical mirror was positioned approximately 110 cm from the participant. To take the records in the natural head posture, the participants were asked to walk a few steps, stand at rest facing the camera and near to the scale, and look into their eyes in the mirror. The lips should also be relaxed, adopting a normal position. The operator ensured that the patient's forehead, neck, and ears were clearly visible during the recording. The photographic records, 35 mm slide format, were cropped using the Adobe Photoshop CS3 and were digitized and analyzed using the FACAD (version 3, 4, 0,3; copyright ©: Llexis AB 2010; 3.4.0.3A, Liesis AB company, Linmoping, Sweden) software program for the Windows operating system. The program was previously customized with the landmarks used in this investigation. The software calculated all measurements once they were identified on each landmark record [Figure 3], [Figure 4], [Figure 5], which had previously been digitized and scaled to life size. All the manual procedures were undertaken by the same operator. A descriptive statistics analysis was carried out for male and female samples. Sexual dimorphism was evaluated by Student t-test. The intra-rater reliability of the method was analyzed using Dalhberg's formula  method error (ME) = √Σ (x1-x2)2/ 2n to determine the difference between 2 measurements made at least a month apart. For this purpose, 100 randomly selected records were retraced and redigitized. Descriptive statistics data including mean, maximum, minimum, and standard deviations for Indian photogrammetric angular measurements are shown in [Table 2] and [Table 3], and Student's t-test comparing male and female measurements are shown in [Table 4]. The results of the method error assessment are shown in [Table 5]. The nasofrontal angle (G–N–Prn), nasolabial angle (Cm–Sn–Ls), and mentolabial angle (Li–Sm–Pg) showed statistically significant gender differences (P< 0.05), and these three angles showed large variability in maximum and minimum values in both males and females. The nasolabial angle (males = 106.64 ± 8.68, female = 103.67 ± 8.49, P < 0.05) and mentolabial angle (males = 132.7 ± 9.45, female = 128.6 ± 9.28, P < 0.05) were statistically more acute in females than in males. The cervicomental angle (G–Pg/C–Me) and angle of the medium facial third (N–Trg–Sn) also showed statistical gender difference (P< 0.05), but angle of the medium facial third (N–Trg–Sn) showed no larger variability, whereas cervicomental angle (G–Pg/C–Me) showed large variability from 69.9° to 91.4° for males and from 67.5° to 92.6° for females. 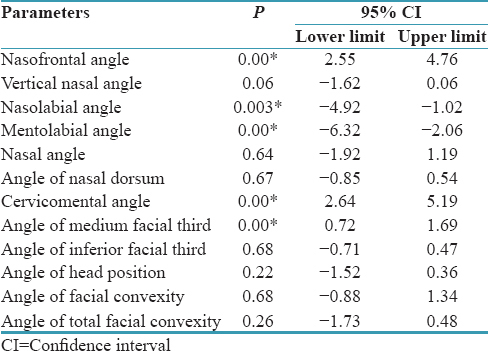 The vertical nasal angle (N–Prn/N–Ort), nasal angle (Sn–Cm/N–Prn), angle of the nasal dorsum (N–Mn–Prn), angle of the inferior facial third (Sn–Trg–Me), and angle of the head position (Trg–Ort/Sn–Sm) showed statistically insignificant gender differences (P > 0.05). The purpose of this investigation was to obtain average parameters that define the soft-tissue facial profile of the Indian population. The characteristics of the soft-tissue profile are affected by many factors, including ethnicity. As the profile varies according to the malocclusion, the present study used only Class I participants to establish norms. The inclusion criteria and methodology were formulated to identify normative values that can assist in diagnosis and treatment planning for those seeking orthodontic treatment or orthognathic surgery. On the other hand, skeletal variations may exist in participants with a Class I molar relationship. For example, Casko and Shepherd  reported that cephalometric values for a sample of participants with normal occlusions showed variation far beyond the mean values which are often used to achieve treatment goals. For this reason, in the present study, the selected participants were also judged to have well-balanced faces. As it was intended to obtain a representative sample of normal Indian participants, patients who had undergone orthodontic or facial surgical treatment were not included. Differences may exist between normal and esthetically pleasing profiles, and difficulties in the application of supernormal cephalometric data have been related to racial differences. Thus, normal occlusion, which is not necessarily related to beauty, was the main criterion used to select the participants. It has also been argued that natural head position (NHP) is the logical reference and orientation position for craniofacial analysis and the publication of illustrations. Individuals are presented as they appear in life when using NHP. Consequently, lateral profile photographs recorded routinely in NHP would be more clinically meaningful. Although several anthropometrical investigations have been performed to identify acceptable facial profiles,,,, these studies cannot be routinely used in clinical settings. Furthermore, although the facial profile is a balanced and harmonized structure composed of several esthetic subunits, these studies are limited to focal aspects of the facial profile. In addition to direct anthropometry, several facial analysis systems and landmarks have been introduced.,,,,,, However, most of these systems, except for those that are photographically based, require expensive equipment and complex procedures, and provide data that are difficult to evaluate mathematically. Most of the plastic surgeons working on facial esthetics evaluate and use photographs or “real” patients and not roentgenograms for the treatment planning. There can be no argument about the overall reliability of cephalometric analysis. However, an appropriate skeletal pattern does not imply desirable facial esthetics nor does an undesirable skeletal pattern imply undesirable facial esthetics. On a daily basis, most orthodontists carry out soft-tissue analysis mainly in a subconscious and unstructured manner. However, in the present study, soft-tissue facial measurements were established by means of photogrammetric analysis to facilitate orthodontists to carry out more quantitative evaluation and make disciplined decisions. Photogrammetric analysis offers some advantages in terms of human profile analysis. The angular measurements are not affected by enlargement as in cephalometric analysis. Thus, the technique can be used clinically for both pretreatment planning and evaluation of postoperative results. Second, every profile fiducial point can be moved freely on a computer monitor using the cephalometric software program to determine the most appropriate profile points. Furthermore, the collected data can be arranged in unified charts. In the present study, assessing the inter-rater variability may strengthen the reliability of the study. The nasofrontal angle (G–N–Prn) demonstrates significant gender difference. This finding is not similar to that of Epkar, who found no gender differences in Caucasians on frontal and lateral facial views. But in Indians, female shows significant higher values than male which indicates that Indian females have prominent nose as compared to males. However, the nasal (Sn–Cm/N– Prn), vertical nasal (N–Prn/TV), and nasal dorsum (N–Mn–Prn) angles showed no statistical significant difference with respect to gender, which is similar to that of Epker. However, McNamara et al. found statistically significant gender differences for the nasal tip angle in a study of 141 adult Caucasians that satisfied the criteria of pleasing facial esthetics and a Class I occlusal relationship. The method employed was based on cephalograms. Lines et al. provided a mean range of 60°–80° for the angle of the intersection of the nasal dorsum and a tangent to columella. The present results are different from the findings of Fernández-Riveiro et al., who reported considerable gender differences in these angles. The relationship between the nasal base (columella) and the upper lip, analyzed by the nasolabial angle (Cm–Sn–Ls), is one of the facial profile parameters with greater clinical and thus should be interpreted with caution. 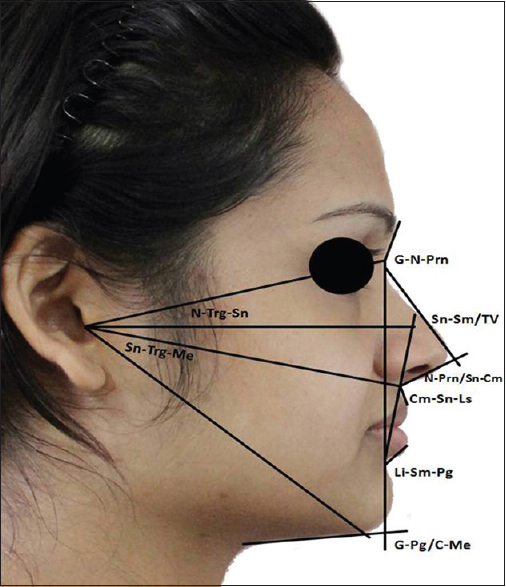 In the present sample, nasolabial angle showed large variations, males show significantly higher values than females which is suggestive of increased proclination of maxillary anteriors in males as compared to Indian females. Burstone  reported a nasolabial angle of 74° ± 8° (range 60°–90°) in a Caucasian adolescent sample with a normal facial appearance. Likewise, McNamaraet al. reported a nasolabial angle of 102.2° ± 8° for males and 102.4° ± 8° for females in a study on lateral cephalograms of adult Caucasians with pleasing facial esthetics. Yuen and Hiranaka  reported an angle of 102.7° ± 11° for males and 101.6° ± 11° for females in a study of Asian adolescents on standardized photographic records. The mentolabial angle (Li–Sm–Pg) was significantly wider in males than in females. McNamaraet al. also found similar results of 133°–134° ± 10°. The mentolabial angle (Li–Sm–Pg) was significantly wider in males than in females, which denotes that mandibular anteriors are upright over the basal bone in Indian males as compared to females. The cervicomental angle (C–Me/G–Pg) was significantly more acute in males than in females, which is suggestive of prominent chin and deep neck in males than that of females. These results are similar from those of Fernández-Riveiro et al. The lower profile orientation was analyzed by the line Sn–Sm, and the true horizontal or the angle of head position but no gender differences were found. Likewise, Fernández-Riveiro et al. reported 74.5° ± 5° for males and 76.1° ± 5° for females. Arnett and Bergman  presented a clinical facial analysis based on previous studies and their surgical experience. 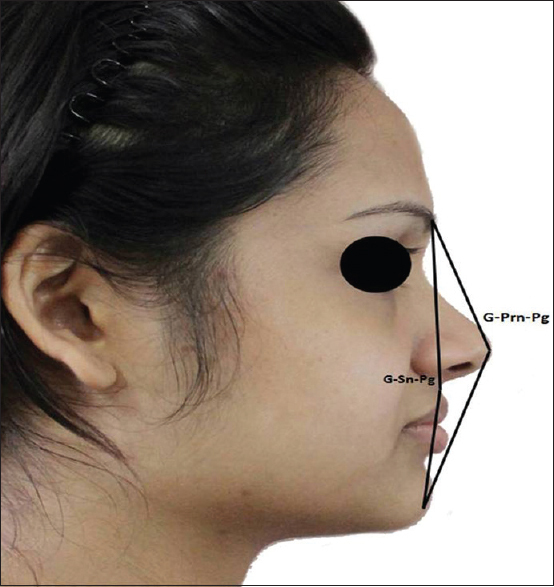 For the facial examination, the angle of facial convexity (G–Sn–Pg) was used to assess the convexity/concavity of the profile. According to those authors, a Class I profile presented an angle range of 165°–175°, a Class II profile <165°, and a Class III >175°. Yuen and Hiranaka  reported for their Asian adolescent sample on photographic records, a angle of facial convexity (G–Sn–Pg) was 162° ± 5° in females and 161° ±6° in males, and the angle of total facial convexity (G–Prn–Pg) was 142.35° ± 5.36° in males and 142.57° ± 5.29° in females. No sexual dimorphism was found. In the present investigation, the facial and total facial convexity angles were similar in both males and females. 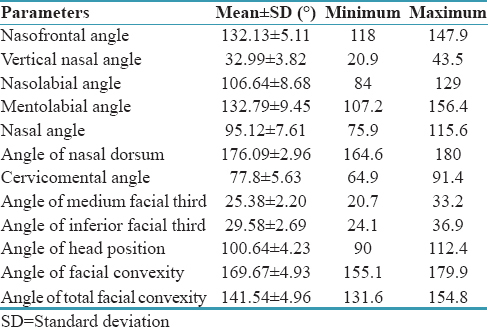 The average facial angle and total facial convexity angles were 169° ± 1° and 141° ± 1°, respectively, for Indian samples which indicates that Indian population have a convex facial profile with prominent nose. Peck and Peck  studied standardized cephalometric and photographic records of Caucasians with pleasing faces. They used the facial angle to assess the soft-tissue facial profile. They analyzed vertical height by means of angles such as total vertical (N–T–Pg), nasal (N–T–Prn), maxillary (Prn–T–Ls), and mandibular (Ls–T–Pg) angles. In this investigation, the middle and inferior facial thirds were evaluated by the N–Trg–Sn and Sn–Trg–Me angles. The inferior third was larger than the middle third. This suggests that Indians have increased lower anterior facial height with long face (Epker 1992) also reported that linear lower face height (Sn–Me) was larger (38%) than the upper (G–Sn: 32%) in relation to total face height in Caucasian participants. Orthodontists use various skeletal, dental, and soft-tissue analyses to diagnose and formulate a treatment plan. Angular photogrammetric profile analysis enables the orthodontists to determine the various soft-tissue segments of the face. The mean values obtained from the present study can be used for comparison of participants with the same characteristics. 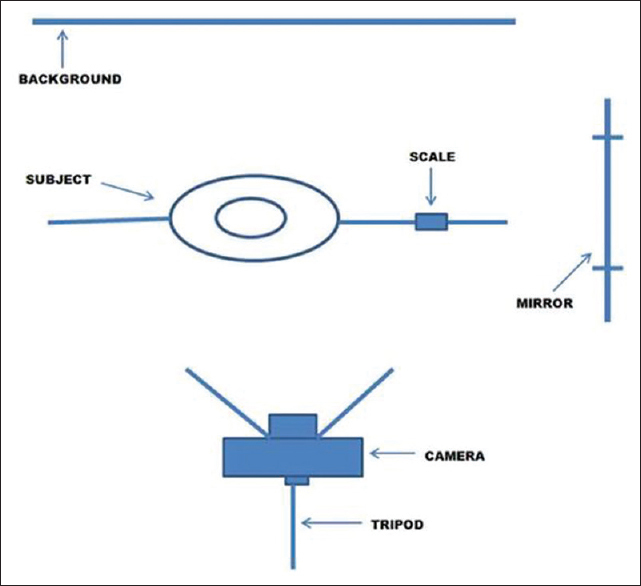 Thus, soft-tissue norms for the Indian population have been established using angular photogrammetric analysis. In all these parameters, males showed larger values than females in Indian population. Hershon LE, Giddon DB. Determinants of facial profile self-perception. Am J Orthod 1980;78:279-95. Riedel RA. Esthetics and its relation to orthodontic therapy. Angle Orthod 1950;20:168-78. Dahlberg. Statistical Methods for Medical and Biological Students. New york: Interscience Publication; 1940. Pogrel MA. What are normal esthetic values? J Oral Maxillofac Surg 1991;49:963-9. Peerlings RH, Kuijpers-Jagtman AM, Hoeksma JB. A photographic scale to measure facial aesthetics. Eur J Orthod 1995;17:101-9. Cooke MS, Wei SH. The reproducibility of natural head posture: A methodological study. Am J Orthod Dentofacial Orthop 1988;93:280-8. Merrifield LL. 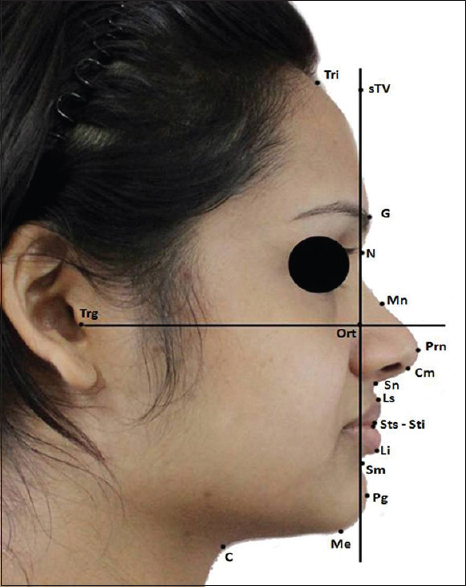 The profile line as an aid in critically evaluating facial esthetics. Am J Orthod 1966;52:804-22. Holdaway RA. A soft-tissue cephalometric analysis and its use in orthodontic treatment planning. Part II. Am J Orthod 1984;85:279-93. Major PW, Johnson DE, Hesse KL, Glover KE. Landmark identification error in posterior anterior cephalometrics. Angle Orthod 1994;64:447-54. Ferrario VF, Sforza C, Schmitz JH, Miani A Jr., Serrao G. A three-dimensional computerized mesh diagram analysis and its application in soft tissue facial morphometry. Am J Orthod Dentofacial Orthop 1998;114:404-13. Park HS, Rhee SC, Kang SR, Lee JH. Harmonized profiloplasty using balanced angular profile analysis. Aesthetic Plast Surg 2004;28:89-97. 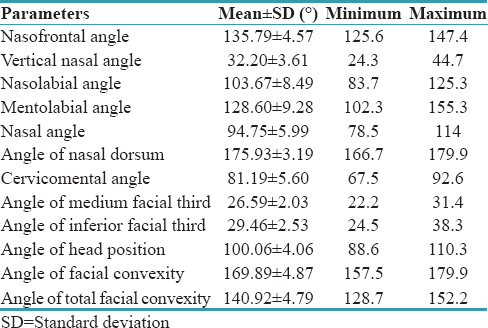 Neger M. A quantitative method for the evaluation of the soft-tissue facial profile. Am J Orthod 1959;45:738-51. Burger HJ, Rossow PE, Standen I. Profile enhancement and cephalometric landmark identification. Am J Orthod Dentofacial Orthop 1994;105:250-6. Peck S, Peck L. Selected aspects of the art and science of facial esthetics. Semin Orthod 1995;1:105-26. Auger TA, Turley PK. The female soft tissue profile as presented in fashion magazines during the 1900s: A photographic analysis. Int J Adult Orthodon Orthognath Surg 1999;14:7-18. 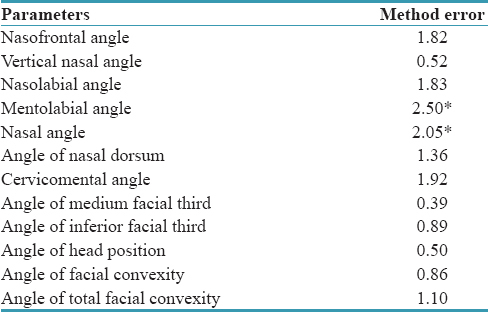 Fernández-Riveiro P, Smyth-Chamosa E, Suárez-Quintanilla D, Suárez-Cunqueiro M. Angular photogrammetric analysis of the soft tissue facial profile. Eur J Orthod 2003;25:393-9. Miyajima K, McNamara JA Jr., Kimura T, Murata S, Iizuka T. Craniofacial structure of Japanese and European-American adults with normal occlusions and well-balanced faces. Am J Orthod Dentofacial Orthop 1996;110:431-8. Lines PA, Lines RR, Lines CA. Profilemetrics and facial esthetics. Am J Orthod 1978;73:648-57. McNamara JA, Brust EW, Riolo ML. Soft tissue evaluation of individuals with an ideal occlusion and well-balanced face. In: McNamara JA, Carlson DS, Ferrara A, editors. Aesthetics and the Treatment of Facial Form. Monograph No. 28, Craniofacial Growth Series. Ann Arbor: Center for Human Growth and Development, University of Michigan; 1992. p. 115-46. Yuen SW, Hiranaka DK. A photographic study of the facial profiles of Southern Chinese adolescents. Quintessence Int 1989;20:665-76.